Home Google Tricks How to Tech Tip How to search images in Google effectively? How to search images in Google effectively? Searching for images can be really painful and getting the right picture becomes even more difficult when you have stringent requirement of resolution,size, filetype and other stuff so on so forth. Today I will show you how to easily get images of your choice in Google. Google is a vast ocean of information, files and other resources. Running smart queries can get what you want easily. Today we will focus just on images. Advance image selection Mode: You can easily enable it by choosing images in Google search. Filetype: PNG, Jpeg, Gif etc. You can search for images belonging to a particular extension example cat filetype:png will get you all relevant cat images of png file extension. Type:Yo can filter out face, photo, clip art, line drawing based on your requirements. Resolution: You can choose Small, Medium and Large categories. 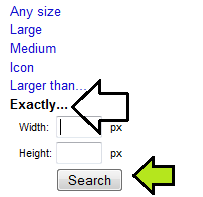 Exact Resolution: Click on Exactly Button to specify exact resolution of image which you are searching for. Icons: Just click on Icons to get icons of what you are searing for. Color: Choose a particular color image or black and white images using the respective options. Sizes: If you want to see each images resolution then just click on Sizes and every images resolution will be displayed in the corner. All these options are available in the sidebar in the left hand side once you activate the image search mode.These modes are like filtering images in to your specific criterias with a very simple interface thus focusing on images you are searching for.This really is very useful to target images which you desire. Note: Not all images listed in Google can be freely used, images may be subject to copyrights. Just because something is listed in Google does not mean its free. But yes you are free to share this post by clicking on any one of the sharing options listed.